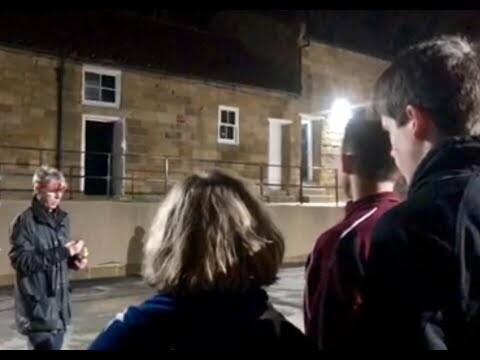 The beginning of March saw two star party events coinciding with the half term ‘dark sky window’, one at Fylinghall School and the other at Danby Moors Centre. After a very fine and unseasonal end to February (almost summer like) it was almost inevitable conditions returned to those normally associated with late winter:- in a word, unpredictable. Observations outdoors was not possible at either event, and yet they could be construed as being successful. For the event hosted on Friday 1st by Fylinghall School, low cloud cover prevented anyone looking through an eyepiece at the night sky. Event organizer, Angelique Russell, greeted us on arrival in the school dining room, where ‘Baytown Coffee’ were serving hot drinks to the gathering crowd. 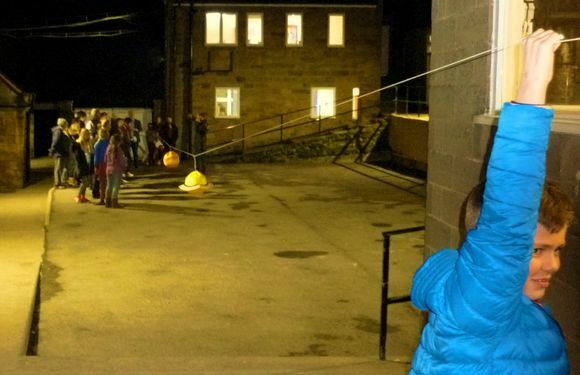 The school ‘stack yard’ was the venue for our ‘scaled solar system’, which because of the calm conditions was always going to be demonstrated. 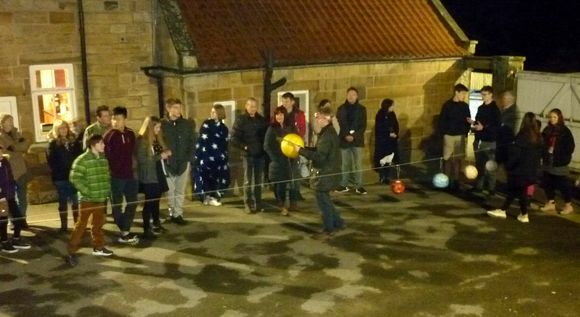 Using both the ‘planetary scaled string’ and the inflatable planets tied on at the relevant distances, proved both popular and informative for the majority watching on. Further audience participation demonstrated in a very rudimentary fashion the movement of protons within the core of the Sun. Plan B, and proceedings moved inside to the theatre barn, where after some IT connectivity issues had been sorted, Mark gave a presentation on the various types of deep sky objects astronomers observe. This looked great on the large screen and at least allowed the audience to view in detail some of the objects we had hoped to observe outside. Angelique was rather relieved with the way the evening turned out and had some very positive feedback, from the students and members of the public alike. Suffice to say we will be returning later in the year, hopefully when skies are clear! Another day…and another event, this time at the Danby Moors Centre for the National Parks ‘Dark Sky’ event at that location. The weather had changed somewhat, from quiet, cloudy conditions, to blustery, rainy ones and although the chance of a clearing was forecast for the evening period, it failed to materialize and the loaded scopes were in the main not required. Greeted once again by Karen Wills- events organiser at the Centre, and Paul Wood, who is also now a WDAS member, we found ourselves indoors - again, the weather not even suitable for demonstrations outside. It felt like déjà vu, all over, with conditions strikingly similar to those experienced at the October Dark sky event. Time for plan B and C, and after some scaled down, scaled demo’s, in which a number of the 46 strong audience were roped involved, Mark gave a quick tour of the night sky utilising the Starry Night program. 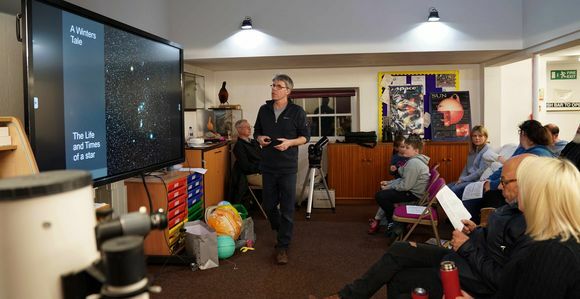 Following a tea break, (at which members ably assisted Karen and Co) it was confirmed that observations outdoors were definitely not possible, so Mark gave a presentation on stellar evolution using the ‘winter G’ asterism as the area of reference. It appeared to be well received with positive feedback afterwards. More or less on time (21:00h) the event ended and as we packed up and reloaded the vehicles, yep, you’ve guessed it, skies cleared and there arrayed in all its glory was our ‘story’ of stellar evolution.... drat it! Oh well, better luck next time. Many thanks are due to Keith, Barbara and Mark for their assistance on the Friday and Saturday, as well as Andy L, Lee, John R and Paul W for assistance on Saturday, and without who’s help both events would have been impossible. Image Credits (Danby): Keith Deason.